This is a cake that will never be too dry. It tastes good even without the syrup, but adding the sticky, sweet liquid lemon will give you so much satisfaction! It makes for the most aromatic citrus experience, provided you use the right lemons. Before you make it, please try and use the best and most fragrant (organic) lemons you can possibly find. You will use the juice and the zest, so it’s totally worth it! Make sure all your ingredients are at room temperature. Preheat your oven to 180ºC / 355º F conventional setting (depending on your oven). Mix butter and sugar together in a large bowl until creamy. Beat in the eggs one by one. Sift the flour and baking powder. 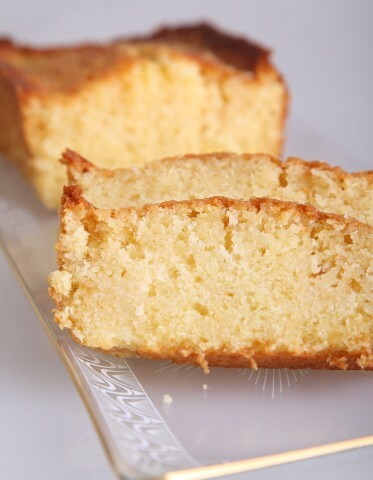 Gently combine the lemon zest, flour and baking powder with the milk and the creamy mixture of eggs, butter and sugar. Spoon the mixture in a greased cake tin (approx. 21 x 11 cm / 8 x 4.5 inches) and spread evenly. Bake for 35 minutes in the preheated oven or until well risen and nicely golden brown. You can make the syrup while the cake is in the oven. Pour the lemon juice in a saucepan and add the sugar. Let dissolve on low heat, bring to the boil and keep it boiling for one minute. Remove from heat and stir in the lemon zest. Leave until needed. Take the cake from the oven and with a skewer immediately start making holes in the top (the more the better, because the syrup will be able to find its way through the whole cake). Pour the syrup over the cake and into the holes. Leave to cool in the cake tin. Krijg nou het apezuur, wat een snoeperig cakeje haal ik net de oven uit! Het zachte knetteren dat ik hoorde toen ik de siroop over de hete cake uitgoot, deed me watertanden. En dan die geur… echt iets voor een zuurpruim als ik. Volgende keer probeer ik 50/50 bloem en amandelmeel. Want we blijven experimenteren – ook als het goed is! can i use all purpose flour instead of cake flour? Yes, that is no problem, the texture will be a little different but the result will still be very good. Just make sure you sift the flour before use.